Boxer Joe Calzaghe has said he will not be voted BBC Sports Personality of the Year because he is a winner. The WBO and IBF super middleweight champion suggested losers do well in the show, which is being held at the NEC in Birmingham this year. 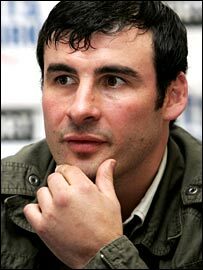 Calzaghe has never made the shortlist of contenders for the annual award. "Does it bother me that I've not been put up? Of course not. At the end of the day, maybe it's because I'm a winner," said the 34-year-old Welshman. The winner of the award, which will be presented on Sunday 10 December, is decided by a public vote from the shortlist on the night. In a new move, nearly 3,000 members of the public will be able to attend the 2006 show, which is taking place outside London for the first time in 53 years. Asked about the award, Calzaghe told BBC Five Live: "Look at people like Greg Rusedski and Tim Henman, have they ever won Wimbledon, what have they won? "It seems like the country gets behind losers." Henman has never won the award. He was second in 1997, the year fellow British tennis player Rusedski claimed the honour. Canadian-born Rusedski triumphed after finishing runner-up at the US Open. Bookmakers make Ryder Cup hero Darren Clarke current favourite for this year's prize. Unbeaten Calzaghe is generally rated fifth favourite behind world equestrian champion Zara Phillips, Scottish tennis star Andrew Murray and England cricketer Monty Panesar. The competition is regarded as particularly open after England's footballers flopped at the World Cup. 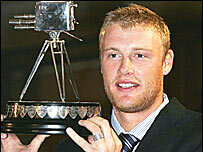 Recent Sports Personality winners have included five-time Olympic champion rower Sir Steve Redgrave (2000) and England Ashes hero Andrew Flintoff (2005). Calzaghe told BBC Five Live: "The football team loses, the cricket team loses. Listen, I'm a winner, I'm a champion. "I don't need no award or recognition, I'm proud of my achievements." Calzaghe defends his WBO super middleweight title for the 19th time when he fights Sakio Bika of Cameroon at Manchester's MEN Arena on 14 October. In an interview with the Daily Telegraph last weekend, the fighter had said he did not care about being recognised. "I'm the longest reigning world champion in Britain," he said. "I'm happy in my own ability. My name will live on. Full stop. Look in the record books. And it's not finished yet." He added: "As a nation, it looks like you haven't got to be a winner to be a personality."